Its been seven weeks of In-Depth and I would say I’m learning at a good pace. My mentor is busy and we’re not meeting as frequently as I would like but over the past two weeks, we facetimed and she taught me some skills via video chat, more specifically pinch pots and how to sculpt a nose since I wanted to learn more on sculpting realistic faces. Over the weekends or during lunch times, I would like to facetime with Mieko and have her guide me while I have all the materials in one room. Her graduation school applications are due soon and I understand she is occupied with that. During spring break, we will both have more time and we will schedule meetings more often. 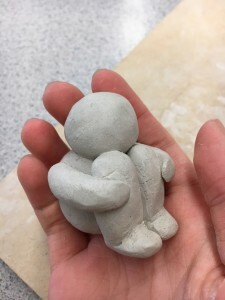 On many school days, I would go to the ceramics room at lunch and sculpt. I use the bag of clay I bought from the art teacher and I would work for the 45 mins I have. While I do accomplish and finish some projects, most of them are not good enough for me to decide to keep so I usually squish them and restart. As I keep developing my skills, I’m hoping to be able to keep more of the projects I make. On the weekends, I bring some clay home to work. That way I’m not always confined to the 45 mins I have during lunch and I’ll have more time to sculpt. On the last In-Depth blog post, I touched on my updated goals but there are some more I want to add in order to keep me on track. Spring break is coming up fast and I want to use that time to focus on sculpting. I won’t have access to the school’s kiln so I’m planning on finding a public art location where I can use their kiln to fire my projects. 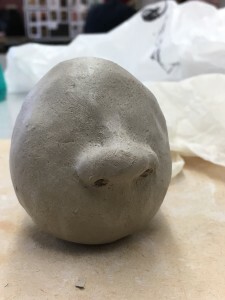 Upon researching clay, I discovered a brand/type of Japanese clay that can be fired in a regular oven. I was really excited when I found this and I also found some YouTube videos that showed them working with it. I plan on getting some to experiment with and if I can successfully sculpt with it, it will definitely make acquiring materials a lot easier. My mentor also introduced me to some art shows in Vancouver and recommended me to visit some art galleries. I haven’t had the time to go yet but I am looking into the dates and schedule of some upcoming shows that I can go to. Getting some tickets to the Vancouver art gallery wouldn’t be so bad either. Thanks for sharing some of your work. When challenges arise, you find solutions. Sounds like this project has been the right choice for you. You are allowed to have more than one mentor if your first mentor is not able to meet with you often enough.